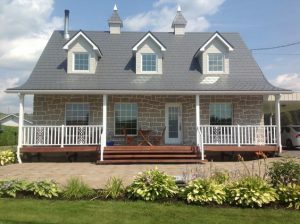 Wakefield Bridge is a steel style of shingle which is made from the company Ideal Roofing, who are located in Ottawa. Ideal Roofing is a leading manufacture not only in Steel Shingles, but also steel flashing, steel trims, steel siding and steel building products. Wakefield Bridge steel shingles are created by using new and recycled steel, which is cost efficient as the price does not experience any fluctuations of world market oil prices, unlike Asphalt shingles. The Wakefield Bridge steel shingles are designed with four interlocking sides with no exposed fasteners, which will give your home a clean and stunning lock. The steel shingles are covered with a PVDF paint (Polyvinyledene Fluoride) that is baked on along with the innovative Kynar 500 resin. It also has a Cool Roof solar reflection technology that reduces the cost of air conditioning in the summer and keeps the colour from fading from solar radiation. 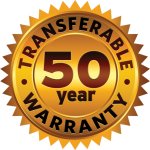 Another benefit from having Wakefield Bridge Steel Shingles installed is the Limited 50 Year Warranty! If you are tired of experiencing leaks, and having to re-shingle every 10-15 years, than now is the time to contact 1st Choice Home Solutions for a Free Estimate! If you already know you would like to have the Wakefield Bridge Steel Shingles Installed but aren’t sure of what colour, make an appointment and we will make sure to bring out our samples!